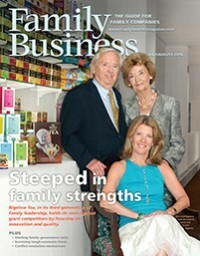 Family Business Magazine—July/August 2014 Publish at Calameo or read more publications. Thinking of a shareholder transition can be daunting, since it deals with "retirement." Preparing one's estate is often put on the back burner until it is too late. But proper planning can make these transitions less onerous and more comfortable for all parties involved. Transitioning ownership will affect the shareholders, the shareholders' children, the management team and the employees. The effects of a transition on these groups—and the effects these groups might have on a transition—should be carefully considered. In the nearly 20 years since Sam Menaged opened the Renfrew Center, it has become the world's largest network of eating disorder treatment centers. Renfrew, founded in 1985 as a single residential treatment facility in Philadelphia, now has more than 500 employees at 14 locations in 12 states. The center gets its name from the 27-acre Renfrew Farm, its flagship location. When the Affordable Care Act (ACA) went into effect in January 2013, it came with an unexpected consequence that family business shareholders are still scrambling to understand. The new 3.8% tax on earnings hits shareholders who are considered passive investors in S corporations—generally those who work fewer than 500 hours a year in the company. As many of our clients are discovering, the financial impact of the tax can quickly jump to the six figures and continue to increase as the company becomes more successful. Best board practices were the focus of the second annual Private Company Governance Summit, presented jointly by Family Business and Directors & Boards magazines and held at the Dupont Circle Hotel in Washington, D.C., May 7-9. The conference drew about 150 participants, including owners and directors of family and other closely held businesses, stakeholders in private equity-owned companies, and advisers to privately owned businesses. At Laboratory Testing Inc., an independent testing company in Hatfield, Pa., steel, iron and other materials get pushed, pulled, dropped, squeezed, stretched, smashed, dissolved and shattered. The phrase "seeing around corners"—the ability to go beyond linear strategic planning and predict the competitive environment's future twists and turns—has become business-literature jargon. The gift of foresight is a highly sought-after quality in prospective CEOs and board directors. Yet too few family business leaders apply this type of thinking to their family relationships. How would significant growth of the business and increased family wealth affect the way relatives interact with each other? 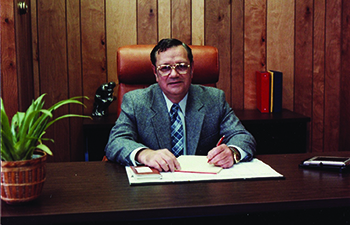 Star Lumber & Supply, based in Wichita, is the largest locally owned building materials corporation in Kansas, with about 325 employees and annual revenues of approximately $110 million. The company, which is celebrating its 75th anniversary this year, is led by third-generation members Chris Goebel, 56, chairman of the board and CEO, and his cousin Patrick Goebel, 43, president and chief operating officer. Star has eight locations in Oklahoma and Kansas. An old wood-and-iron Chinese tea blender greets visitors to the Bigelow Tea headquarters in Fairfield, Conn. The sturdy machine, the size of a VW Beetle, was the first piece of industrial equipment the company acquired. It aptly symbolizes not the dusty past, but the rugged fortitude required to carve out a future for the 70-year-old family concern.